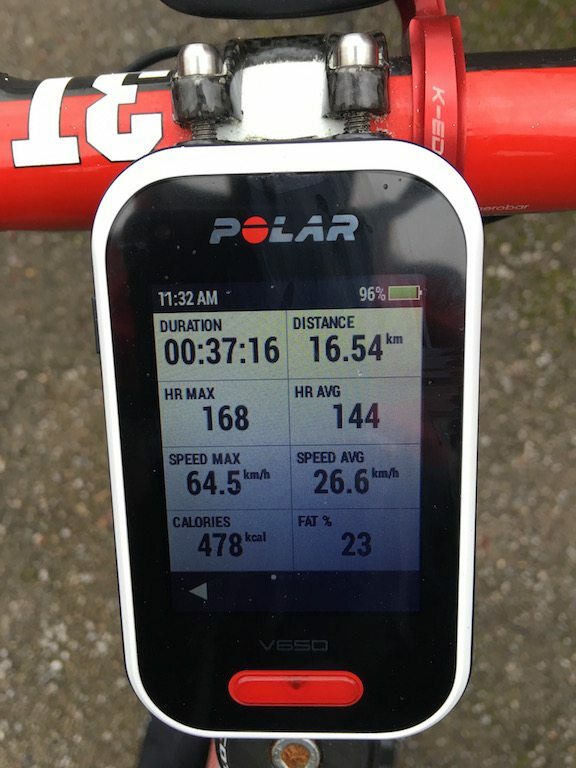 The Polar V650 has been around since 2014. That is a long time in gadget years. Is this 2018 update enough to keep the big Polar unit competitive and able to fight against the onslaught from Garmin and Wahoo… just possibly! Polar had a bit of a habit for 2017, of refreshing units via their software features, and giving them a new model number. I’ll direct you to the Polar M460 GPS unit, and the Polar A730 activity tracker if you’re in any doubt. Which sounds like a slightly negative tone, but for the fact that the Polar M460 is actually a very good bit of kit. This time Polar has not even changed the colour of the V650, and I have to confess to initially wondering are the changes actually going to be noticeable, thankfully they are! As with the Polar M460, the Strava integration into the Polar V650 is probably the tent pole upgrade, but that is not to diminish that the Polar V650 is already a very capable bit of kit. So that is what the box says, but how. Does these updates stack up in real life? Let’s find out! 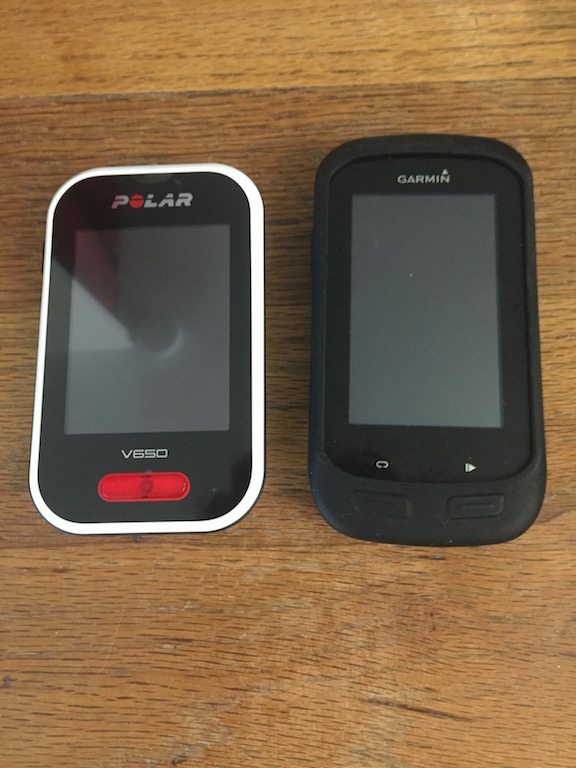 The Polar V650 is not a new GPS unit, and that alone might put some people off. However the old adage of “if it ain’t broke down the fix it” certainly comes to mind, as the Polar V650 hosts several clever design features which frankly should be considered for inclusion in many more products. But before we get to that, what’s in the box?! In the box, we’ve got quite a range of included kit, particularly so for the £150 which you can find the Polar V650 in some parts of the net. Let’s look over the Polar V650 itself. From a purely design perspective, I do think the V650 looks very good. There is clearly a visual design to it, which seems to be lacking on many other GPS units, with the white and black shell, and contrasting red “action” button. Although perhaps people could say the new Garmin 1030 has had it’s colour scheme inspired by the Polar V650… maybe. That said, I do think the loseng shapped button on the front really should be lit up. But that is just me! Now prejudice up front, I’m not a fan of directly attached stem mounts. But that’s what we have. Given how long the Polar V650 has been on the market, as an additional draw for 2018, I’m surprised that Polar have not included an out front mount in the box as well, of this their flagship cycling head unit. The nature of the mount means it doesnt really get on with flat stems if you go for the stem mount option, which slightly reduces the clean lines. Which is a shame. But all of those points are relatively minor. What I don’t like is that the unit grips into the mount with more friction than the mount does to the bike, whether we are using a flat, or normal round stem , so putting the unit on and off, results in the mount being pulled around, and frequently means that as you ride, the mount shifts and you can end up with a wonky GPS. Which my OCD doesn’t like. Staying in the back of the unit, we’ve a white flap, proudly proclaiming Bluetooth Smart, still not ANT+ here. Come on Polar, Kinetic have seen the light! Under the flap we’ve the micro USB port and the various serial numbers. I’ll be frank; I get the idea behind carbon fibre frames and aero design. It makes sense. Unless you are Bradley Wiggins or doing a TT, the difference of 20-30grams, on the GPS unit isn’t going to make a difference, and you are going to miss out on great features. 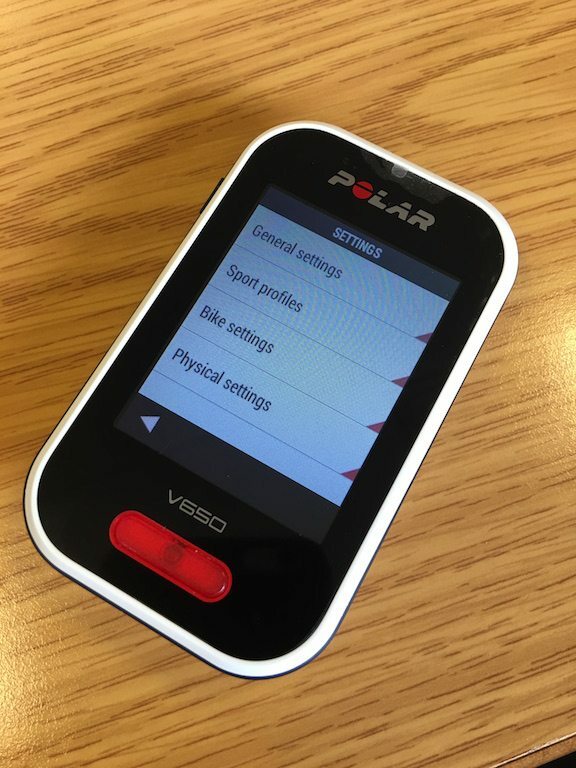 So Polar have “wasted” some weight with the V650, but that has enabled them to make a better real world unit. 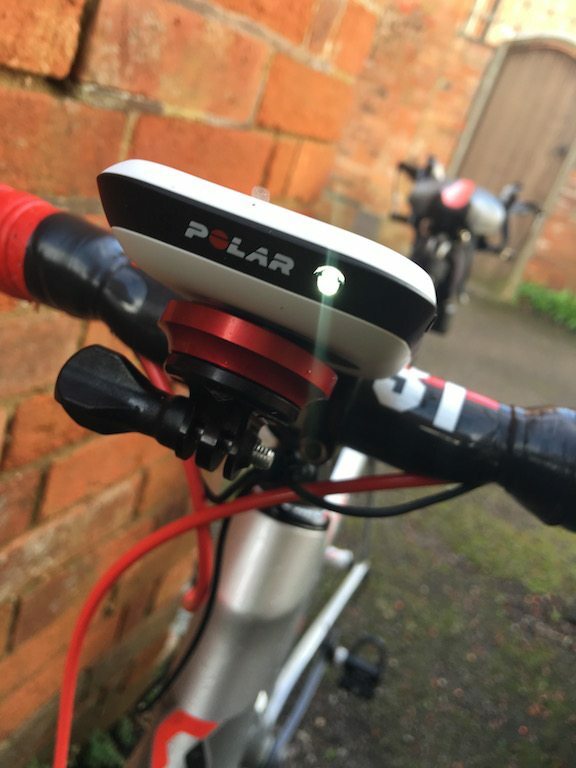 Because I kid you not, they have included a safety light on the Polar V650!! Seriously Polar have incorporated a small forward facing LED into the forward facing edge of the unit. Why has no one thought of this before?? Yes, it means that the unit is probably a hair thicker than it needs to be, but it’s such a clever idea! One area which perhaps the Polar V650 isn’t quite as hot though is the screen, whilst beautiful colour screens look great indoors, they just get washed out when on the sun is out. The Polar V650 is no different here, cracking indoors, less so under direct sunlight. 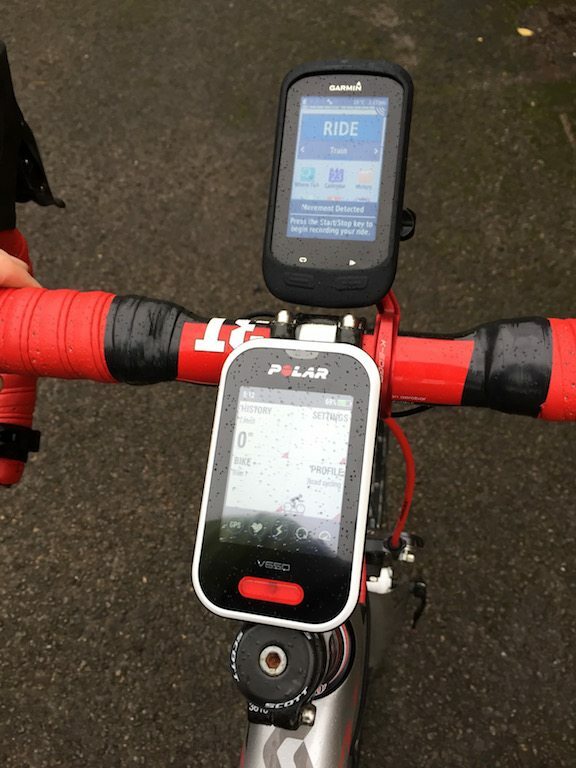 Polar’s own M460 and the Wahoo range of cycling GPS unit have really demonstrated the currently, monochrome is best for cycling, as when it comes to sports, is not about how many millions of colours your unit can display, but how easy it is to read. Ok, that’s the overview, let’s go for a spin! Polar has created a Bluetooth-only device, but include the most important part, the Bluetooth heart rate monitor in the box, so you are ready to go, right from the offset. The included Polar Bluetooth strap can record heart-rate variability which is required for certain parameters within the device. 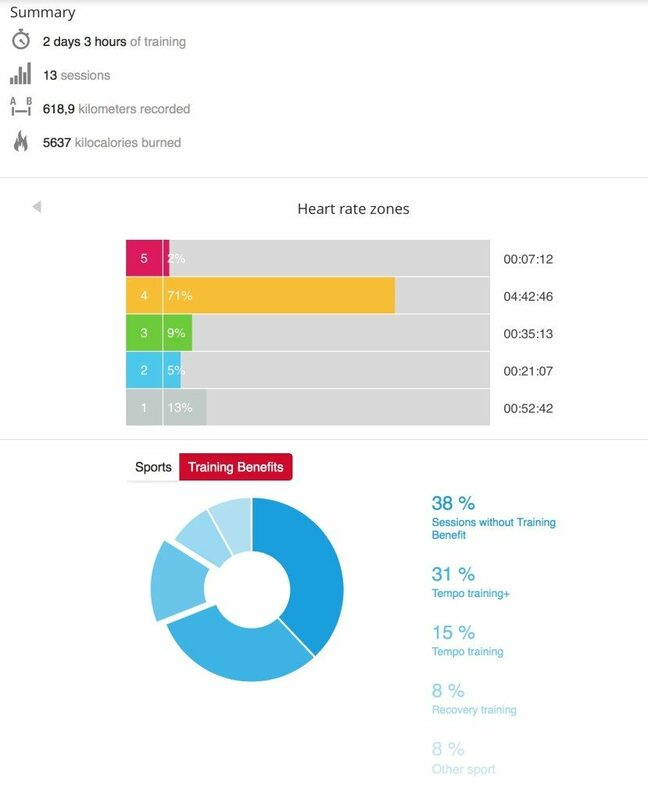 This is quite important, as not all Bluetooth HR straps give pulse rate in the way that the Polar V650 can read, in order for that data to be used to calculate Orthostatic and Fitness Tests. Profile, indicating the type of activity you are doing. But then things will work a treat! You also have the option to display many data fields in a graph based form, which can actually improve the “at a glance” viewing, so see what your performance is currently like. The Polar V650 is Bluetooth Smart only, no ANT+. Hence another reason why having dual channel sensors is always a good idea, as it allows you to change bits of your setup, hopefully, without having to replace everything. To do that, you have to go into the settings menu, and use the more clearly named “pair new device” section. 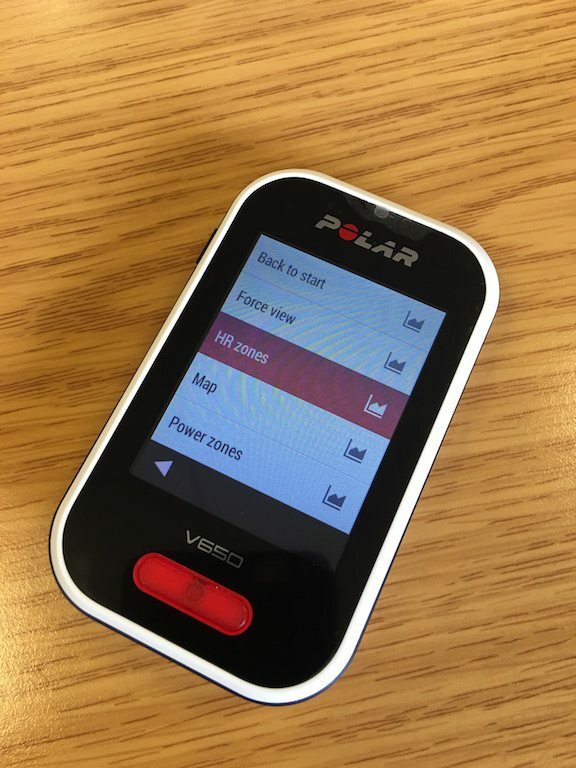 The actual GPS in the Polar V65 is very quick, picking up signals in only a few seconds, certainly on pair with other top end units, and crucially the screen doesn’t bother about water when trying to use it with a gloves finger. But in heavy downpours, you can still lock the screen, stop any stray commands from the rain. The size of the screen certainly helps the unit and in terms of the actual functionality of a GPS unit. I was really happy, with distances and speeds comparing very favourably with other GPS units. Be under no doubt, the Polar V650 upgrade is essentially a software tweak, BUT, and it is a big but, one of the things I have stressed during this review, like the Polar M460, is that a large amount of the attraction for the Polar V650 compared to other units relates to it’s value for money, more so with Strava integration. In one simple move, Polar has replaced the need for a dedicated crash device such as the ICEdot crash sensor, which costs nearly as much on it’s own. Whilst at the same time nullifying otherwise headline-grabbing safety features from devices such as the Garmin Edge 820. Again improving the value of the Polar V650…. well until those first two free months run out! But safety is one thing, getting the KOM is something entirely different. Oh and just for interests sake, the Polar V650 also managed to survive having OTE gel baked on it, during the same ride. Seriously that stuff sets like ROCK! Author of TitaniumGeek, which started after smashing off my RIGHT elbow. Feel free to drop me a line about sports tech, medicine, or frankly anything that you want to chat about!! 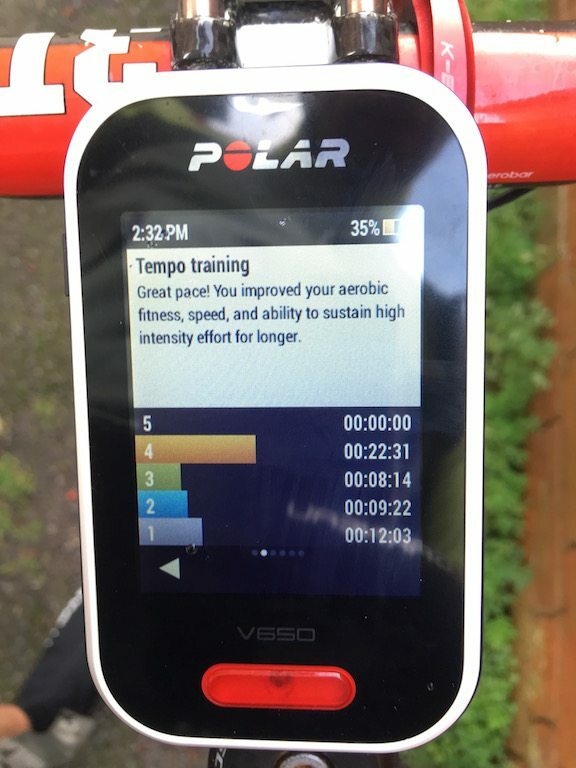 Polar Vantage V Review – A Garmin Killer? Mio 405 HC Cycling GPS Review – A Overlooked Gem?